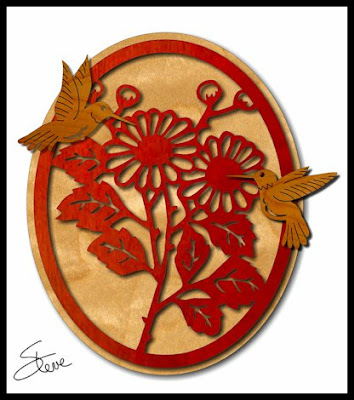 Flower and Humming Bird Scroll Saw Pattern. A quick lesson in practicing our craft. This is a three layer piece of scroll saw art. It is eight inches tall. People send me pictures of their work often. This one came from Randy Hutchcraft. 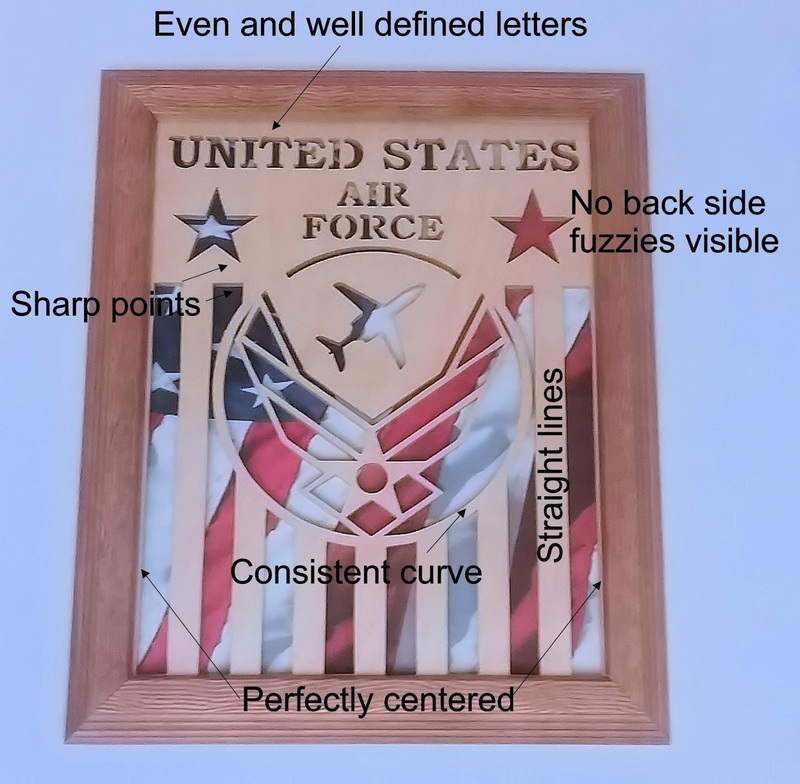 Scroll saw art does not have to be perfect. It is hand made and it's fine to have some imperfections. That said it's always nice to see a piece executed with this level of attention to detail. Enlarge the image and look at my points of interest. It does take some skill to execute a project to this degree but it also takes a willingness to pay attention to detail. 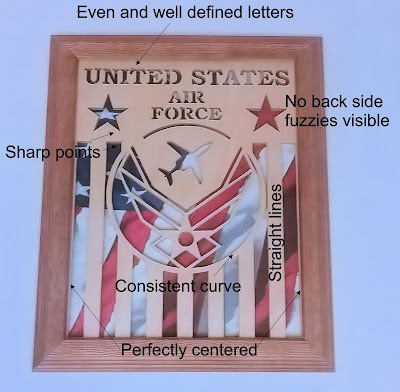 This pattern is not particularly challenging. What is challenging is to take this pattern and do it with this level of quality. All of us can improve our craftsmanship. Sometimes it's good to take a step back and consider what areas we need the most improvement. Curves, straight lines, tight turns and finishing are all areas that can be made better through practice and technique. Don't be overly critical of your work because unless you are entering a contest most other people will not nit pick it. Keep the attitude that there is always room for improvement in technique. Work towards a goal. All art is a process. If you don't enjoy the process then it's difficult to stay motivated to go into the shop. 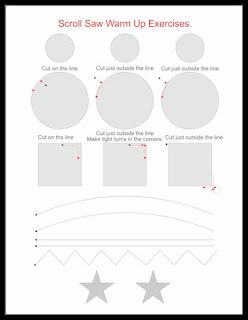 Print out some circles and a few rectangles. When you go in the shop spend just a few minutes practicing technique before you start a project. This will get you hand eye coordination working. You can use this warm-up page if you like. Just click the page and it will download a pdf that you can print. Thanks Randy. I appreciate you allowing me to point out the areas of your project that we could all work on. You really did a nice job and I thought it would make a good lesson. Enter the Bear Woods $50 Gift Certificate Giveaway. There are only a few days left so keep entering daily. Make sure you visit our sponsor Bear Woods and bookmark the page for reference. Bear Woods carries the Pegas brand of scroll saw blades. Pegas blades are what I use. They are sharp and made of high quality steel. I think they are the best blades on the market. If you want to give them a try Bear Woods now has no minimum order. Buy a few of the Pegas blades and see the difference for yourself. Bear Woods will lose money on these small orders but they know that once you try Pegas blades you will be back. 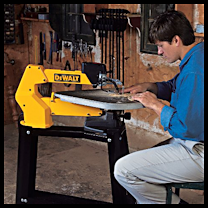 The DeWalt DW788 is the most popular scroll saw on the market for the serious hobbyist. I have owned two and they were both excellent machines.